Youtube is undoubtedly the best video resource on the Internet. But the only bad part about almost every Youtube video out there is the vulgar comments. For kids, you can enable "safety mode" in your Google account so only family friendly videos appear in search results or on youtube.com suggestions. But that only means the video is family-friendly and not necessarily the comments. With the flood of inappropriate comments, watching videos could easily lead to embarrassing moments especially with kids around. The solution is to disable or hide Youtube comments. Unfortunately, Youtube doesn't have an option to disable comments. So the only alternative is to hide the Youtube comments in your browser. Lets see how to do this for both Firefox and Chrome. Hide Youtube comments in Firefox. More than # spelling mistakes: The number of mistakes is customisable, and the extension uses Firefox's built-in spell checker. The best option is to completely disable comments especially on a family computer. You could just turn it on whenever you want to watch Youtube videos privately. 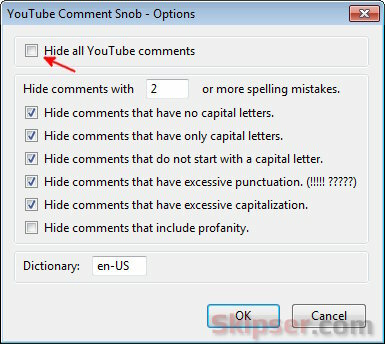 To do this, open "Comment Snob" options from Firefox addons manager and check the box which says "Hide all Youtube comments". That's it, no comment will appear on any further Youtube page you open. Hide Youtube comments in Chrome. For chrome, the extension is "No Youtube comments". Once installed, it will hide all comments and response videos in any Youtube.com page. You can also choose to show video responses or a button to toggle showing comments from the extension options. With the "Comments Toggle Button", you will get a "Comments" button beneath every Youtube video which you can use to un-hide the comments. Both these extensions work equally good for hiding comments. Here's how a Youtube page will look without comments. Isn't it neat and cool? Do you know any other tool that can do the job better? Please do add in your valuable suggestions as comments below. Download Comment Snob for Firefox. Download No Youtube Comments for Chrome. How to Use an Android Phone As a Webcam For PC [Windows & Linux].